Q. 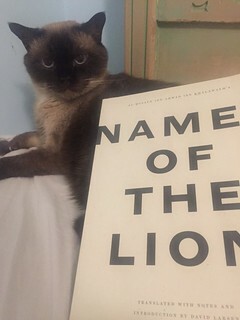 What kind of book is Names of the Lion? A. A thesaurus. A word list. A bestiary with only one beast. A. As a virtuoso display of learning by a man who considered himself the greatest living authority on the Arabic language, and was so considered by others. Q. Can you say more? A. At the time of the grammarian Ibn Khālawayh's life and work, the study of Arabic had reached a mature phase. Many books of grammmar and lexicography had already been written and re-written by successive generations of scholars. Although the works of Ibn Khālawayh are steeped in this tradition, they depart from received models. His longest and most innovative text, The Book of "Not in the Speech of the Arabs," is organized aphoristically into short chapters. Each chapter begins with the phrase "In the speech of the Arabs there is no X , except for..." followed by all the exceptions to the stated rule. 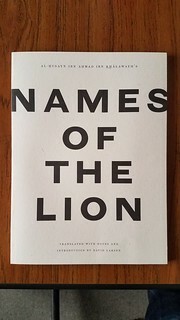 Names of the Lion is a chapter from this work. 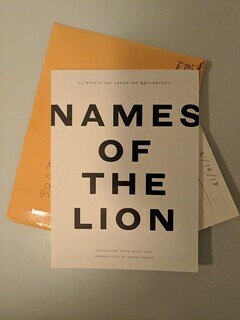 It begins: "In all the speech of the Arabs and all books of Arabic philology put together, there are no names for the lion besides what I have written for you." 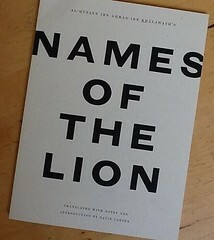 Hundreds of words for lion then follow. Q. Okay, but why lions? A. Why not lions? Ibn Khālawayh produced word-lists on other subjects: names of the wind, the sword, the serpent, etc. (You can read his names of the undershirt on this blog.) This was a well-established genre of linguistic scholarship, and it's not clear that lions were a particular obsession with Ibn Khālawayh. It is true however that the Asiatic lion (Panthera leo persica) was endemic to Syria, and a real-life scourge of the pastoral economy. It is also true that no one who encounters a lion in the wild ever forgets it. Q. Is this why are there so many Arabic words for lion? A. In Classical Arabic there are many, many words for all kinds of things. To say why would be a rash mouthful. Q. 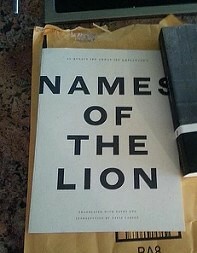 It almost sounds as if Names of the Lion isn't a work of literature! A. If by "literature" you mean an intentional work of poetry or artistic prose, then it's actually not. But that's a narrow definition. "Pleasure reading" is a much broader category than that - at least for the seekers and dreamers of the world, and sophisticates on the lookout for the next thing. Formally, the text will be familiar to everyone. It is a list, and there is abundant precedent for the list as a poetic form. In our day, the list poem is a standard exercise of Creative Writing because it never fails to yield interesting results. (And there is in fact Classical Arabic precedent for list poetry predating Ibn Khālawayh's.) So whether or not Ibn Khālawayh had any conception of Names of the Lion as a work of language art, to enjoy it as one is practically irresistable. More fancifully, you could call it Ibn Khālawayh's answer to poetry - his vengeful attack on it, even - which would make it even more interesting. Q. 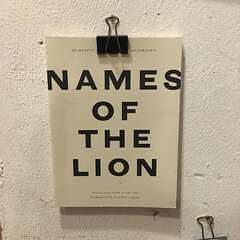 What was your source for the Arabic text of Names of the Lion? A. The text is preserved in a unique manuscript held by Istanbul's Süleymaniye Library, catalogue no. MS 'Alī Shahīd Pasha 2143, fol. 114v9-118v11. The relevant pages are viewable and downloadable here. These same pages were edited for print by the Iraqi scholar Maḥmūd Jāsim al-Darwīsh, and published as Asmā' al-asad li-'bni Khālawayh (Beirut: Mu'assasat al-Risāla, 1989), which you can see and download here. Q. How are the unboxing photos? A. Pretty good so far. Tasteful backgrounds - wood grain, mostly, and one granite countertop. Current favorites include a quilted rainbow bedspread (courtesy Robyn O'Neil), and the expression on the face of Sara Salem's cat (above). Take a look! A. Sarah Irving at Arabic Literature (in English) was very kind. It also won mention in Brad Johnson's summer 2017 reading list at An und für sich, and in a distinguished bibliography accompanying Rivulet 3. For a 2019 "micro-review" by Paul Cunningham, visit the website of Kenyon Review (and scroll down). Q. 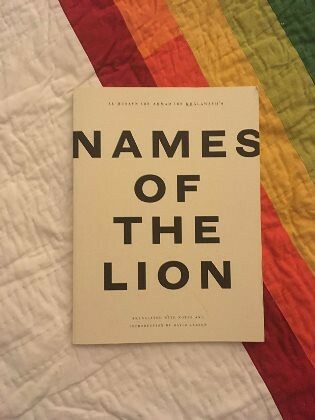 Where can I get my copy of Names of the Lion?